Last week, Alyssa of Apron Anxiety asked for a side dish she can make for dinner she was cooking for her friends. 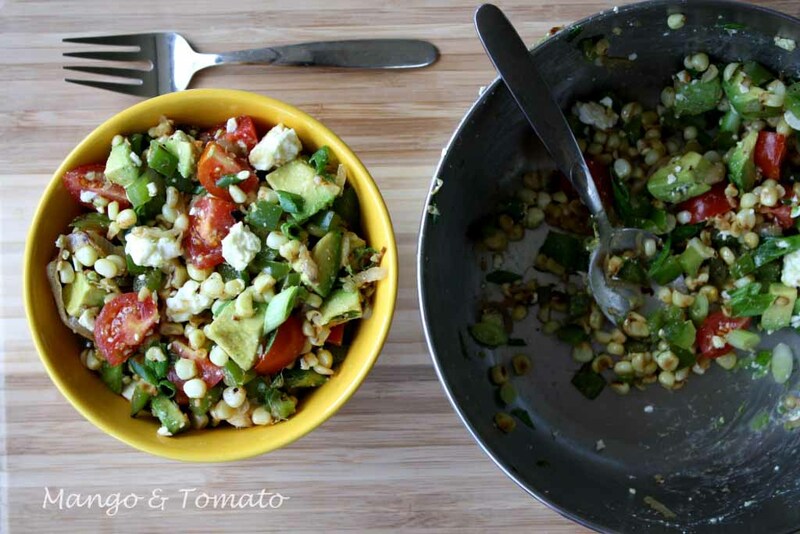 I emailed her an "outline" of a corn salad: sauteed corn with shallots, added to fresh tomatoes, avocado, some herbs and topped with feta. Alyssa made it and said it was a total success. Why not make it myself, I thought? And so I did! After all, summer is pretty much over, and soon both the corn and tomatoes will taste like a slightly better version of cardboard. This salad is great served right away or after a few hours of refrigerator time (if you choose to leave it in the fridge, add avocado right before serving so that it doesn't turn brown!). 1. Heat olive oil in a pan. Add corn, green pepper and shallots. Season with salt and pepper and add a pinch (or more) of cayenne. Saute for 5 minutes. 2. 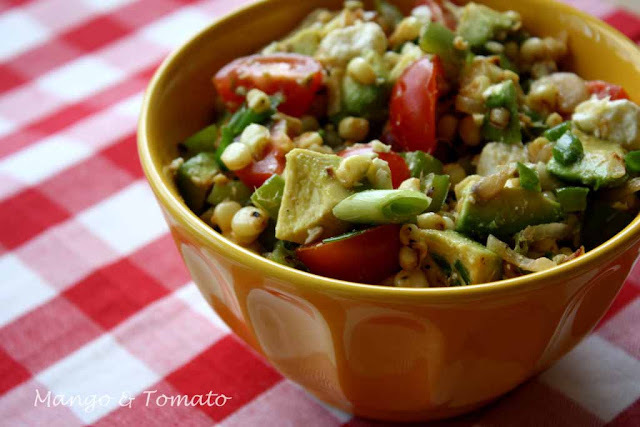 In a mixing bowl combine tomatoes, avocado and scallions. Add corn/pepper/shallot mixture and mix with crumbled feta. Optional: add a drizzle of olive oil and some lemon or lime juice (I did not find it necessary to add either one). The pinch of cayenne really brought out the natural sweetness of the corn and tomatoes. There was no need to add too much salt because of the saltiness of feta. This is a really refreshing salad/side dish and a great alternative to your typical potato salad or guacamole. 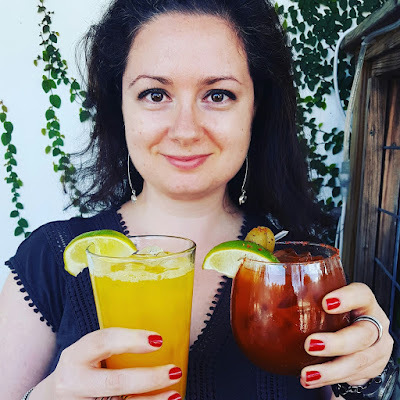 This coming Saturday, September 11th, I will be participating in a food blogging panel at the Great Grapes! Wine, Art & Music Festival in Reston. If you are free and live around the area, please come and say hi :) Thanks to Lisa for recommending me! this looks yummy! similar to the impromptu salsa dan & i made. it was actually more delicious than any salsa i've ever had. except maybe mango-peach salsa. i love that stuff. I made something similar a few weeks ago but minus the peppers, shallots, and scallions. I bet those additions give this dish so much flavor! I will definitely miss corn and tomatoes as the summer dwindles away. I love making simple salads like this. I do love your gorgeous salad!! what a perfect salute to the end of summer! 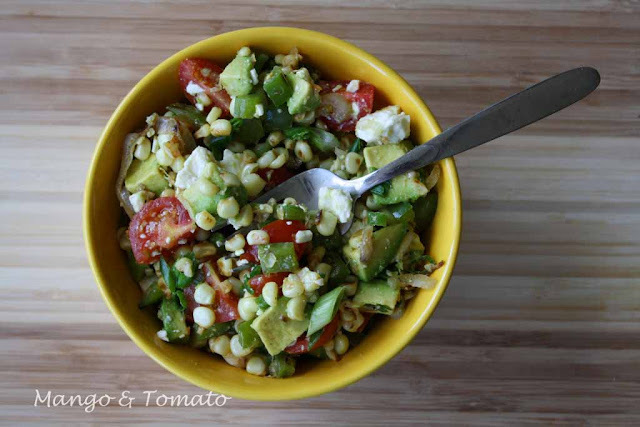 I love that salad, you have two of Denise's favorites from quickies at the dinner table...feta and avocado! I made this last night and it's even better the second day. I just brought an avocado with me to the office to mix in. I didn't have feta so I used gorgonzola and it was still good. I plan to make it again this weekend. I made a somewhat similar salad recently: rice, black beans, tomatoes, avocado, scallions, and jalapenos, dressed with a mixture of mayonnaise and plain yogurt. Corn would have been a good addition too but we never have it in the house because my husband doesn't like it (he eats it fresh off the cob, but not in any other way).